Everyday communication has become a complex business. When I started my job, it was so much easier. We had 3 choices: face-to-face, telephone and hardcopy. It was challenging enough then, since few of us received training on communication as part of our education. In years past, I picked up the telephone to communicate without an appointment. If it was a bad time, the other person would tell me and we would set up a better time. 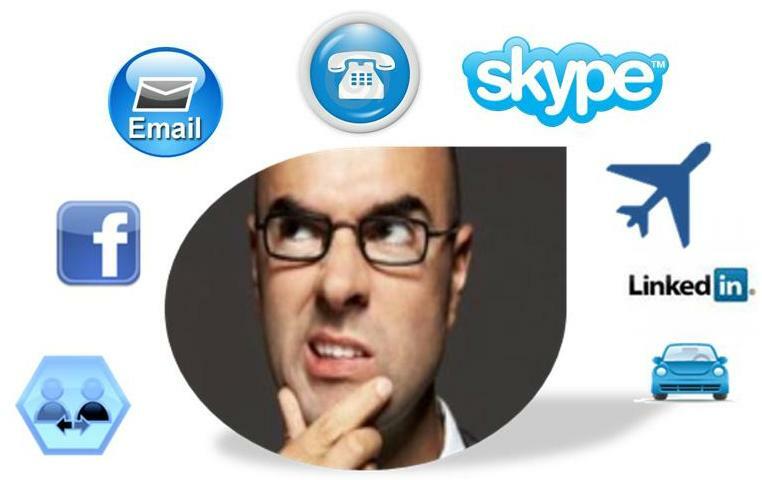 Now we have so many additional choices ranging from old fashioned email, the various forms of social media, texting, blogs, wikis, and face to face electronic conferencing like SKYPE or Google hangouts. Where do you get trained on when and how to effectively use all these ways to communicate? Today many feel compelled to text or email a person to schedule a call, and better yet to avert the call, since many view phone calls as an inefficient use of time, an interruption to their day. Nobody has a monopoly on busy, and this attitude about interruption and efficiency at the expense of building human relationships seems unkind. It also feels selfish to me, since these folks are just considering their preferences, not the other person’s. Email is often used to express emotions or feelings that people are too embarrassed to say. However, I think it’s better to confront the other person and clear things up over the telephone or better yet in person. I have received more rude emails, where people write things they would not have the nerve to say to my face or on the telephone. Another downfall of email is when it gets sent to too many people that don’t need to know or care about your communication. I also notice rudeness in LinkedIn comments, Twitter and Facebook, where there is one up man ship professionally, for example. I resent the number of emails I get in my LinkedIn inbox asking for endorsements; please take a survey; buy my service—which these people presumably blast out to their LinkedIn connections just like email spammers. There is more blatant WIFM (what’s in it for me) in the digital world. Everyone seems to agree that face-to-face is still the best way to connect as you can read the person’s body language which is so revealing. But in today’s world we are so scattered that many of us can’t easily or cheaply meet face-to-face. I always recommend that people connect the next best way which is often the telephone, SKYPE or Google hangouts. However, email is still the steam engine for digital communication since it leaves a written trail, and you can communicate with many people simultaneously in one email, and time zones don’t matter. You can also attach a document for people to review, not an option with the phone, but an option with SKYPE or Google hangouts. A best cooperative intelligence practice is to think about how the individual you want to reach likes to be communicated with, even if it’s not your preference. People in Sales figure this out pretty quickly. They call; they fax; they email; they in-mail; whatever it takes connect to decision-makers. Another cooperative best practice is only send communication to those who will value it. I am pretty open minded about communication. I like to stay in touch with friends and colleagues. In one win/loss project, I was doing one on one interviews. I emailed to set up a call with one non-customer. He refused, but did offer that he would be happy to email me answers to my questions. I got some of the best insight from this gentleman—all because I listened and accepted his preferred communication. I completely agree with the need to find out people’s preferred communications methods. Frankly, it shows respect – for them AND for their time. I’m working on something right now with regard to audience segmenation where this topic is key. It all comes down to getting the right message to the right audience at the right time in the right way. No small feat! Vicki: “It all comes down to getting the right message to the right audience at the right time in the right way.” That is the challenge in life. If one of those is off, then you’re off. There are too many ways to communicate today, which results in too much noise, since people are struggling to get their message out, but aren’t sure where their audience is. Never mind the other 3 factors; right message, right audience, right time. Good for you.